For all the Odisha Sarkari Naukri seekers there is an alert for you all. Here you are presented the page from where you can get the exposure of all the latest Latest Govt Jobs in Odisha and the Upcoming Govt Jobs in Odisha 2018 at central as well as belonging to state level. In the region of Odisha there are more than 80 government departments where the jobs are provided to aspirants to get them the right choice they have been looking for. Chekrs, being the notification portal shares with you Odisha State Govt Jobs that matches every educational background comprising Odisha Govt Vacancy for 12th pass, Diploma, MCA, MBA, and many more. Much more than the common Odisha SSC Recruitment or the OPSC Recruitment 2018 you are alerted every day with the jobs of your interest from various teaching, banking, railways, armed forces, police, engineering, medical, etc departments for the most apt Government Jobs in Odisha 2018. You can get the access of these services by allowing the services from jobs.chekrs.com. Through the information shared at Chekrs you can know the eligibility criteria, selection process, its application submission details with the important guidelines paneled so that there is no chance of mistakes. 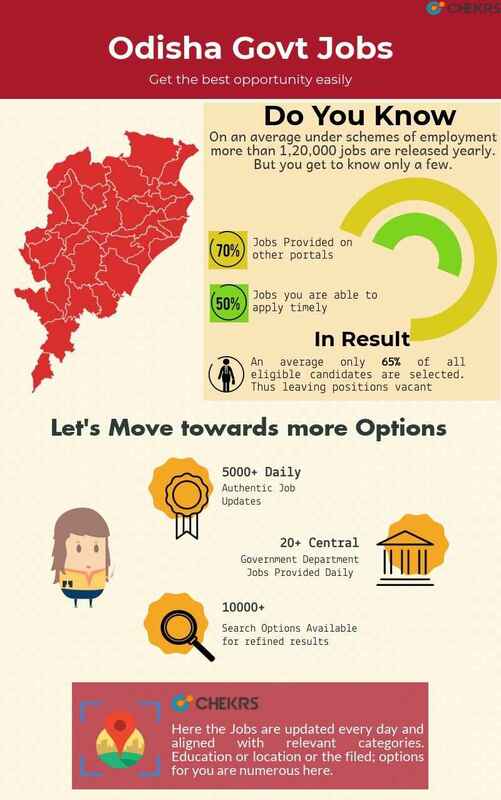 Why you can trust Cherks for Latest Jobs in Odisha? If you are willing to beat the competition of Govt Jobs in Odisha than the extra study material provided by the Chekrs can help you out. Get free ans easy to download previous, sample and model papers for practice. Also quiz and free online mock test can further enhance preparation. You can also take help of daily current affairs.